Our research is diverse and encompasses aspects of organic and polymer chemistries, materials science, pharmacy and biology. We have a strong focus on the development of new materials for biomedical purposes such as therapeutics and diagnostics. To achieve this we develop materials that can respond to specific biochemical stimuli (e.g. temperature changes, nucleic acids). The specific response is dependent on the specific application but typically involves a morphological change in the polymer that either produces a detectable signal (for diagnostics) or results in release of a therapeutic (for drug delivery). Our current focus is in developing a range of materials that respond to the presence of reactive oxygen species (ROS, updates coming soon) that are commonly found at sites of inflammation and inflammatory diseases (e.g. rheumatoid arthritis). In addition to biomedical materials, also work in areas such as protective coatings and cosmetics. Details of some of our current and previous research interests can be found below (click headings to expand). At our heart we are a synthetic polymer chemistry group. Unlike many synthetic groups, we are not wedded to a particularly family of materials or synthetic techniques, instead choosing the tool that we think is the best fit for the job. Chronic inflammatory diseases (e.g. rheumatoid arthritis) are characterised by the over production of reactive oxygen/nitrogen species (ROS). Materials that can change their behaviour (e.g. solubility, morphology) in the presence of ROS have potential applications in the diagnosis of, and delivery of therapeutics to, sites of disease. We are currently developing a range of oxidation-sensitive materials for this purpose. Further details may be found on the project page. Schematic of DNA-controlled revealing of binding ligand. For further details see reference . Materials that respond to an external stimulus (e.g. temperature, pH, redox) have been heavily investigated as triggers for activating drug delivery/release as they may take advantage of variations in local environment found in different tissues or disease sites and thus greater specificity in drug targeting. However, these stimuli and fundamentally "crude", as many in vivo states may effect them resulting in a reduction in specificity. We have demonstrated that by introducing carefully designed nucleic acid segments into synthetic materials that their structure may be manipulated by addition of a complementary DNA strand. Using these methods we can control size, morphology and ligand display in a "programmable" sequence-specific manner with far greater control over trigger than simple temperature or pH. Electron micrograph of a DNA-based hydrogel before and after treatment with complementary DNA. For further details see reference . 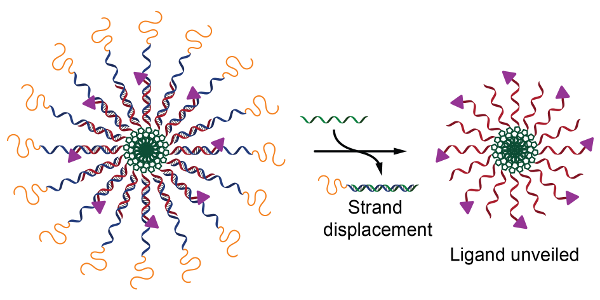 Temperature-dependent cellular uptake of polymer nanoparticles. For further details see reference . We have demonstrated that particles coated with a temperature responsive polymer can be used to selectively target cells based upon temperature. When particles are below the transition temperature the corona is hydrated shielding the particles and cells from one another. Above the transition temperature, dehydration of the corona results in increased cell interactions and subsequent uptake with an increase in cytotoxicty compared to free drug. We are now improving the synthesis of these materials in partnership with AstraZeneca. Nucleic acids are usually considered to be a source of information and is therefore used to induce a specific response (see above) or to up/down-regulate a specific gene (gene therapy and RNA interference). However, they may also be used for the delivery of certain drugs. We have demonstrated a simple system where a double-stranded DNA molecule is modified with poly(ethylene glycol) (PEG, "PEGylation") then loaded with the chemotherapy drug doxorubicin (DOX).